British journalist Francis Wade spent considerable time in Myanmar trying to understand its distant and recent history. 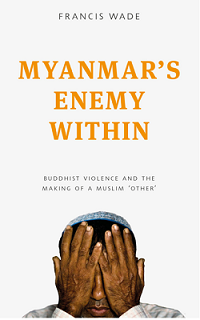 In early 2017 he published Myanmar’s Enemy Within: Buddhist Violence and the Making of a Muslim “Other,” about changing attitudes over the centuries about how the majority Buddhist population viewed Muslims. In his historical investigations, he does not spare British colonialism for the role it played in current tensions, but he lays more stress on developments since the Second World War when Burma – now Myanmar – won independence. A strength of the book, well worth reading, is that Wade listened carefully. He did not make one side good and the other bad. On the other hand, he might have mentioned that the proportion of Muslims in the population was about the same in 2014 and 1931, so the narrative of Islam plotting to overthrow Buddhism by high birthrates, migration and conversion via marriage is not supported by facts of modern Burma. A crucial point of his research is that, prior to colonization, ethnicity was fluid, porous and contingent. Rakhine kings brought in Muslims to fight for them, and ethnic alliances shifted. British colonialists, with their passion for fixed classification, froze the shifting categories and assumed that “races” had permanent characteristics. Further, importation of Indian government workers and money lenders displaced Bamar elites and led to a narrow nationalism that excluded those thought to be colluding with the colonial power. This included many ethnic minorities and eventually Muslims. Wade does not mention the example of Indonesia which opted for an inclusive approach giving citizenship to many ethnic groups. The nation became independent at the same time as Burma yet is peaceful, united, democratic and much richer than Myanmar. Burma did not start out this way. All who could prove a family history going back two generations could be citizens, as could those who lived in the country for eight years prior to independence. This changed over time, especially under Ne Win. Though part Chinese himself, he insisted on the primacy of Bamar Buddhists as first-class citizens. In a citizenship law of 1982, ethnicity and religions were placed on identity cards. Only 135 were officially listed. Those singled out for exclusion sometimes refer to themselves as Rohingya. The majority in Myanmar call them Bengalis or kalar, and the British called them Rakhine or Chittagonian Muslims, a name Ne Win dropped and Aung San Suu Kyi has tried to revive. Ne Win’s approach, continued under subsequent military governments, made Bamar Buddhists full citizens. Other ethnic groups often became associate citizens or naturalized citizens, with the Rohingya lacking legal status at all. Associate and naturalized citizens were second and third-class designations, based on the assumption that “races” had permanent characteristics and others were inferior to the Bamar. Senior General Than Shwe emphasized conversions to Buddhism encouraged by payments and promises of identity cards. This system also led to ethnic and religious minorities using money or friendship with relevant civil servants to “become” the preferred group on their ID cards. But the change on the registration card was not matched by a mental change. The result was a dishonest façade. The recent growth of ultra-nationalism arguing for protection of the Buddhist religion and Bamar race to avoid extermination or absorption by Islam is partly based on international narratives of Islamic extremism and actual outrages by extremist groups. There is also intentional use of ancient examples with limited relevance to the present. True, Indonesia “flipped” from a Buddhist to Muslim country gradually from the 13th to 16th centuries, but the gradual process was peaceful. The resulting religion on Java was syncretic, including many elements of the past. Using that to illustrate the aggressive nature of Islam today is more a reflection of current attitudes than plausible historical analogy. Rakhine Muslims do have higher birthrates than Rakhine Buddhists, and Wahhabi clerics urge these Muslims to have many children. But, according to the World Bank, Muslim Bangladesh has a lower fertility rate than Buddhist Myanmar. Socioeconomic conditions, including poverty and education status, rather than religion are more relevant in explaining varying fertility rates. A poor, rural, uneducated population tends to have more children. Wade does not point out that Rakhine state, with its depressed economy, tends to export young Rakhine Buddhist workers to other parts of Myanmar, which depresses Buddhist population growth. On balance, Wade argues that the military’s interest is to create a dangerous “other,” despite little historical evidence of this in Myanmar’s Muslim populations. Wade suggests that while there are instances of Muslim attacks on military and police, they pale in comparison with the attacks on Muslims carried out by the military, police and thugs. He notes that nearby authorities seldom restrain Buddhist violence, and he quotes observers who wonder if the authorities had orders not to intervene. Heartbreaking parts of Wade’s book describe a Rakhine Muslim man with a pregnant wife who cannot go to a nearby hospital without slow-to-arrive official permission and steep payments to police for security. The city doctor then berates him for not bringing the patient sooner – telling the husband that the mother and child will both die. Unless the country changes its view of Muslims who are neighbors and not terrorists, there is little prospect for peace, prosperity or democracy in Myanmar. Officials routinely refer to the Arakan Rohingya Salvation Army as a terrorist group. Poorly armed, they number up to 10,000 and mainly seem to rally larger numbers of Rakhine Muslims to attack military and police outposts with crude weapons. The Buddhist Arakan Army, which had a working relationship with Rohingya insurgents at one point, also opposes the Myanmar Army but does not engender such fierce reprisals. About 1.2 million Muslims lived in Rakhine in 2014. With the removal of 700,000 since the book was published, the current total is about 500,000 in Rakhine and 1.3 million in Myanmar, or 2.5 percent of the population – less than the 3 to 4 percent share over the longer term. Wade tries for optimism at the book’s end, telling the story of one Rohingya whose father was in the Army. He follows him there, disguising his identity and becoming a captain. He then moves on to the Ministry of Religious Affairs, presiding over conversion ceremonies with insincere converts before being promoted to a posting in Naypyidaw and moving to a private business. For Wade, this illustrates the arbitrariness of the categories – pretending to be part of the “right” group is all that’s needed to contribute productively in a system where appearance trumps reality. Yet Wade acknowledges that simple acts of cooperation or even heroic acts of a few Buddhist monks who protected Muslims must be weighed against the success of Ma Ba Tha that has controlled the narratives of religion and nationality, cowing even the NLD. Unless a way can be found to reconcile ethnic and religious differences, the military role will remain strong, diminishing prospects for a democratic and developed Myanmar. Myanmar could pivot towards Indonesian inclusiveness or follow Pakistan’s path of weak civilian governments and military dominance, marked by continuing conflict. Given the proximity of powerful neighbors, those who want a non-aligned nation rather than one dominated with few choices, would do well to follow Indonesia’s model. David Dapice is the economist of the Vietnam and Myanmar Program at Harvard University’s Kennedy School of Government.